Established 15 years ago, BLG prides itself on its superb customer service and has more than 300 years’ combined management experience. Our employees are highly skilled in property development financing and have previously worked in real estate banking, investment houses and financing companies. Responsive, proactive and solutions driven, our passionate staff will do all they can to help you secure a property development loans Our mission is to help every client with their property development financing. When it comes to housebuilder finance, no two loans are ever the same. That is why each business property loan from BLG is tailor-made to the requirements of each proposed development project. So, whether you are planning to build four new developments in the countryside or a block of flats in the heart of the city centre, BLG will help you to finance the project of your dreams. 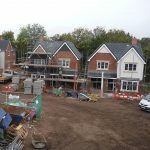 So if you are looking for short-term property finance that will help pay for building and development costs for new housing developments, come and speak to the experts. Our enthusiastic property development finance team is extremely passionate about property development and together we have funded thousands of new builds across the United Kingdom with our focused property development loans. BLG has helped fund thousands of new homes across the UK thanks to our expertise in property development financing. So, if you are looking for a loan for property development or needing help to finance a property development, get in touch with BLG today. We have the power to turn your schemes, no matter how large or small they may be, into a reality with our property development finance expertise. BLG offers you a bigger support team, national coverage and a substantial amount of development funds to lend.